Timewatch®, cloud and on-premises solutions: timesheets, resource scheduling, project costing & billing.  Timewatch are specialists in Professional Services Software solutions and provide all of the customer care and services to maintain your solution. See our Customer list and Customer success stories. Existing customers can upgrade to our latest Version X series as a part of your maintenance program. From simple and easy to use timesheet systems, to outlook time tracking and outlook timesheet entry systems, to resource scheduling, time recording and time and billing, time recording and invoicing or complete PSA, Professional Services Automation Solutions(PSA) which provide timesheets and expense sheets for time tracking and expense tracking, time and billing, resource scheduling and time reporting in both hosted SaaS and on-premises solutions. Timewatch Customer Services ensures your chosen PSA solution is implemented in the best possible way for your services organization. Our solutions are fully scalable from small to medium enterprises (SME) to large international organizations, see here for an overview of our products. Resource Scheduling Solutions include our WhiteSpace and Wallchart products, as well as Time&Space or TimeAndSpace which include resource scheduling as well as time tracking and billing to form a complete Professional Services Automation Solution. New for 2011 is our amazing new Schedule Time Resource Scheduling plug-in for Outlook / Exchange implementations which adds skills scheduling to Outlook. Review the timewatch time tracking, time reporting, timesheet, expenses entry, time & billing, time recording and invoicing, time and billing, resource scheduling and project management solutions, review pricing then if you like what you see, request a test drive. You can compare Timewatch Professional Services (PSA) Solutions as well as our Resource Scheduling solutions here. Automated systems cut administration time, users enter their own timesheets and expenses, redoply administration staff to more valuable tasks. Reporting systems enable detailed analysis of Project, Employee or Team productivity. Proactive, automated email and Web Reporting saves Managers time by automatically allerting them to Key Performance indicators. Faster, easier, real time timesheet & expense entry ensures accuracy and no loss of chargeable time- one or two hours missed a week can accumulate and cost money. All solutions are available individually or fully integratrated to form a Professional Services Automation Solution or PSA Solution for SunSystems, SunAccount, Oracle, Sage, Great Plains etc. Other Resources and site map are available here. flexibly - choose the core components you need: timesheets, expenses, project repository, costing & charging, scheduling, billing, etc. access it via the cloud, grow as you grow, change as your needs change.